When he ran for the White House in 1952, Eisenhower sounded the call for America's religious reawakening. In his acceptance speech at the Republican National Convention, he announced that the coming campaign would be nothing less than a "great crusade for freedom." 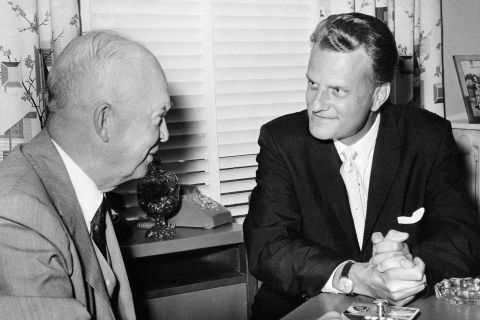 Reverend Billy Graham, a close friend of Eisenhower's, met with him often to provide spiritual guidance and suggestions for specific passages of Scripture the candidate could sprinkle through his speeches. When Ike won election by a wide margin, he interpreted the results as a mandate for a national religious revival. "I think one of the reasons I was elected was to help lead this country spiritually," he told Graham. "We need a spiritual renewal." Ike's inauguration set the tone for his new administration, with a proud, public display of faith. Some of his more ardent supporters had hoped Congress would make Inauguration Day into an official National Day of Prayer, but even without that formal label it had all the markings of one. Previous presidents had quietly attended church services the morning of their inauguration with close friends and family, but Eisenhower turned spirituality into spectacle. He brought most of his Cabinet and their families to a massive service at the National Presbyterian Church. The event had been publicized heavily in the press, so the pews were packed with another eight hundred people waiting in the morning cold outside. The presidential prayer service was repeated all across the capital, with churches and synagogues encouraging congregants to join them in praying for the new president. Even Washington's first mosque, still under construction, announced it would be open for any Muslims who wished to come pray for the president.